A pensioner was forced to the ground by two thugs and robbed of his mobile phone in a cowardly south side attack on Friday afternoon (August 4). The 66-year-old victim was walking along Myrtle Park at 2.50pm when the muggers approached - one riding a bicycle. They forced him to the ground then stole the phone before heading off along Aikenhead Road past Holyrood Sports Centre. One suspect is 5ft 8ins, slim, with short cropped black hair and a moustache. He was wearing a black sweatshirt and black jogging bottoms with white writing on the front. The other. who had been riding a bicycle, is 5ft 8ins, slim, and was wearing a khaki coloured top. Detective Sergeant Graham McCreadie said: “To target an innocent man in this way is absolutely despicable and it is vital that we trace the cowardly individuals responsible. 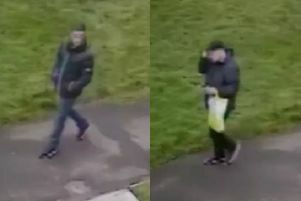 “I would appeal to anyone who was in the area on Friday afternoon, who may have witnessed the incident or noticed two men matching the descriptions, to please get in touch. “Anyone with information is asked to contact the Community Investigation Unit based at Govan via 101 and quote incident number 2284 of Friday, August 4, 2017.